Yokohama Criollo Ale Ale is an unknown beer it seems according to Yokohama Beer as it doesn’t appear on their website and nor does it appear elsewhere in English publications. It’s a 5.5% sweet stout produced in conjunction with the Motomachi area of Yokohama and after further emails, is apparently a winter special so why I found it in summer is beyond me. Thought it was a stout, but no, it’s a porter. 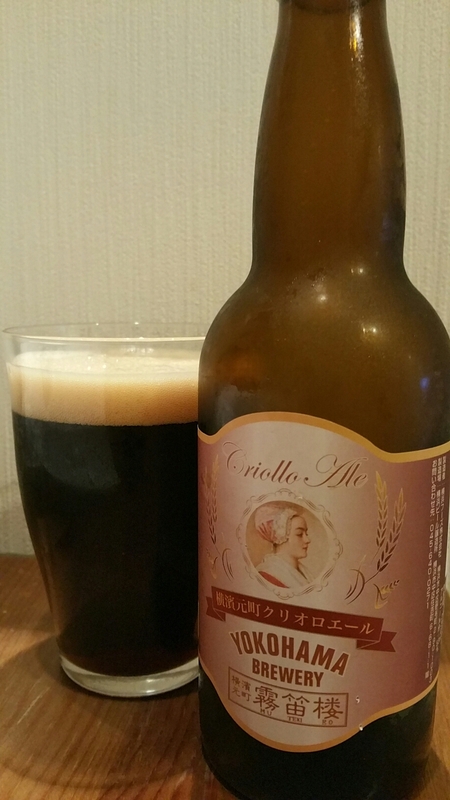 After spending a good few minutes tracking down this beer, in Japanese nonetheless, the reason behind the name “Criollo” is due to the rare cacao beans added during the mashing process. It didn’t have the strongest aroma of chocolate but it was the chocolate edge was stronger than your regular stout though thankfully Yokohama Beer hadn’t gone OTT on the chocolatey sweetness as some other breweries are guilty of doing. The body was a deep black colour laced with a slightly off-white head too. With so much chocolate going on in the beer, Yokohama Criollo Ale was also going to be sweet beer to drink and with that in mind, it wasn’t so much of a surprise when I was proven right. As it warmed up, Yokohama Criollo Ale became sweeter but the slight bitter twang from the coffee helped to dull its strength somewhat to produce a well-rounded sweet stout, nay, porter I would say. Yokohama Criollo Ale needs a bit more balancing but until then, it’s still a nice stout/sweet stout/porter… I don’t know what it is.